NanoWorld Pointprobe® MFM probes are designed for magnetic force microscopy. The force constant and the special hard magnetic tip-side coating of the MFM type are optimised for this type of application. This type of probe yields a very high force sensitivity, while simultaneously enabling tapping and lift mode operation. Soft magnetic samples may be influenced by the tip magnetization! 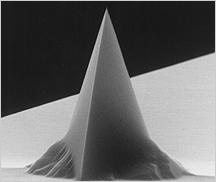 The hard magnetic coating consists of a 40 nm thick cobalt alloy layer deposited on the tip side of the cantilever which leads to a permanent magnetization of the tip with the direction usually along the tip axis. We recommend magnetizing the tip by means of a strong magnet (e.g. a NdFeB magnet, a few millimeters in size) prior to the measurement.